After watching Once, we were amazed by the simplicity and at the same time the breath-taking beauty of the film and the music. The duet decided to grace the equally beautiful SF once again and surely it’s a must go. 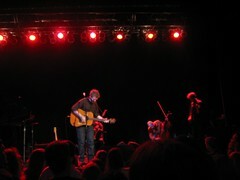 Martha Wainwright opened for them. My only impression of her was the song she sang with Snow Patrol, Set The Fire To The Third Bar. She was not what I imagined but some of her songs were really great. Her voice can be powerful or cute. It was kinda loud in the hall. People in the back couldn’t stop talking. Many of us tried to shush them but to no avail. Nonetheless, Martha appreciated the gesture and the 50 or so of us had a very good time. After a short wait, (anything is short comparing to the time we have to endure at Cake’s concert) Glen appeared from the dark with his famous guitar with holes. We went crazy and I think a girl in front of me almost cried. Music flew from his signature guitar and a moment later, his unique voice caught up. Marketa and the rest of the band (bassist and violinist of The Frames and a French cellist) joined in and together they gave a magical night. We knew that their music is beautiful, but it is powerful beyond imagination live. 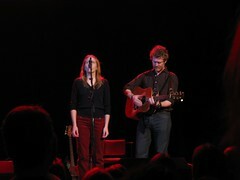 Glen and Marketa looked very approachable which made the performance personal. It’s like chatting with an old friend you haven’t seen for a long time. And Glen did chatted quite some. Different from the image he portrayed in Once, Glen was in fact talkative. He joked a bit and told us stories before the songs, including one featuring a psyche/ghost buster. An old lady fainted on the balcony while Glen was singing Leave made the night even more dramatic. Thank goodness she’s alright. We left the Regency Hall contented. It’s a wonderful night. WYWT.